Once you have defined the general information for a well (see Creating a New Well), you can add the well path information. Open the Path tab in the Configure Well window. This window is displayed once you have saved the general well information. Alternatively, you can also open this window by going to the Well tab in the Control Panel, double-click the well item, and open the Path tab. Click New Well Path to add a well path for the well. The Add New Well Path window will be displayed. If the well is straight or you do not have the deviation information, select Straight Path at Type. At Name, type a name for the straight well path. Type the Surface X and Surface Y locations of the drill hole or the longitude/latitude. Note: Latitude and longitude coordinates must be entered as decimal degrees. For example, 37 deg 53' 06.44" must be entered as 37.885122. For help converting to decimal degrees, click here. At Max MDKB, type the maximum value of the Measured Depth from Kelling Bushing (MDKB) for the straight well. If the well uses a different coordinate reference system (CRS) from the project CRS, click Select CRS to open the Coordinate Reference System conversion tool to convert the well CRS to the project CRS (see Converting CRS When Importing a Well). 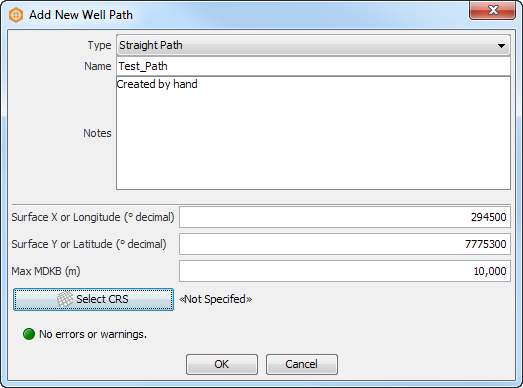 Type any additional information about the well path in Notes. As you enter the information of the well path, you will be notified if there is any error or warning. 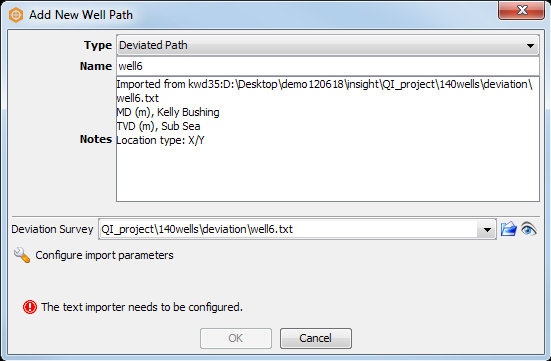 In addition to a straight well path, you can also define a deviated well path by importing a deviation survey file for the well (see Well Import File Formats for more details on the format of a deviation survey file). Insight now also supports horizontal and ascending wells. Note: Insight measures TVD as "depth below", so that increasing values mean an increase in depth. If your deviation survey appears to have TVD recorded as elevation (increasing depth is negative), an error will be displayed. 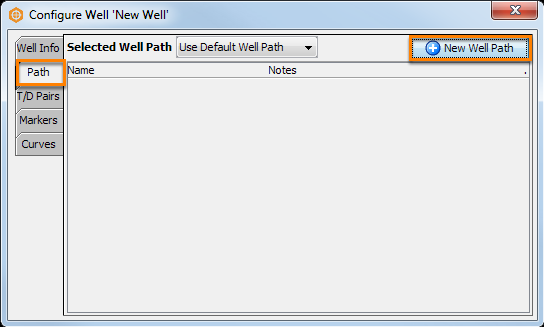 In the Configure Well window, click New Well Path. This will open the Add New Well Path window. At Type, select Deviated Path. At Name, type a name for the deviated well path. If you do not type a name, Insight will enter the name of the deviation file you import. At Deviation survey, click the Select File folder icon. Select the deviation survey file for the well and click Open. By default, information of the selected file will be displayed in Notes. Click the Preview the file eye icon to view the content of the file. As you enter the information of the well path, you will be notified if there is any error or warning. In this example, an error is detected and you need to configure the text importer. See if there is any error/warning indication at the bottom of the window. Adjust the text importer accordingly. Once it is error-free, click OK. The Coordinate Reference System conversion window will be displayed to allow you to convert the coordinate reference system (CRS) of the well to the project CRS. This is needed if the well CRS is different from the project CRS (see Converting CRS When Importing a Well). 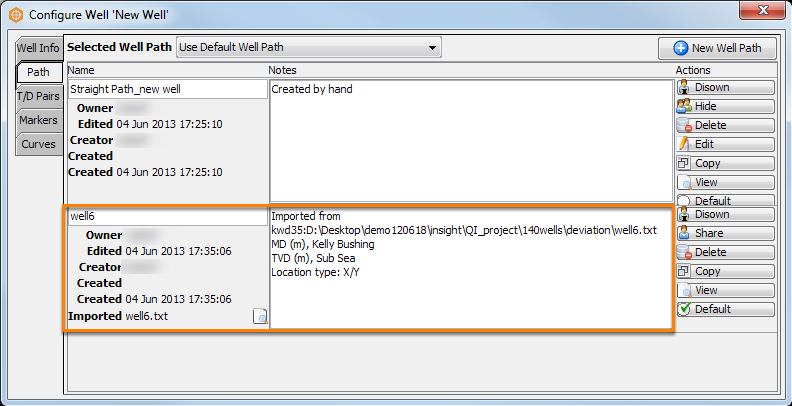 For deviated well paths, Insight also allows you to import X Offset and Y Offset as the location values. 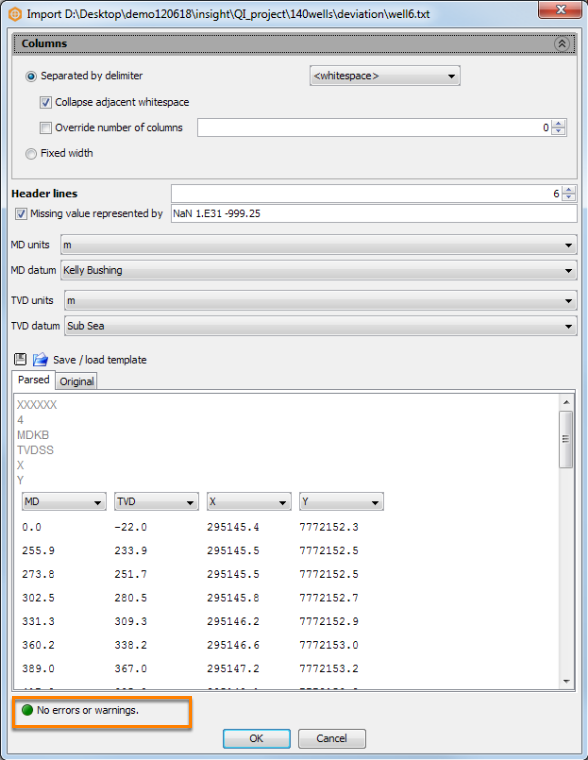 In the location columns, select X Offset and Y Offset. 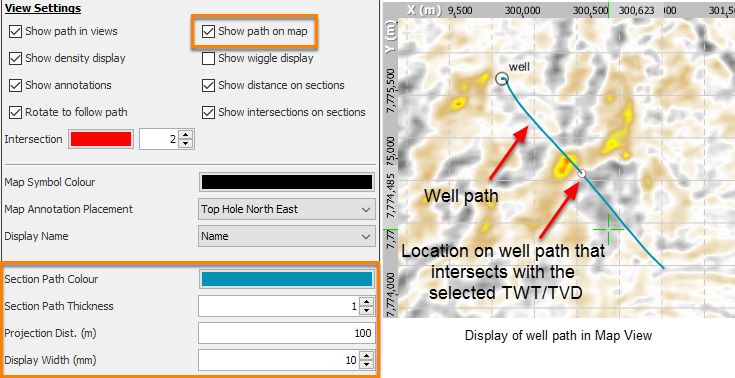 At Surface location, type the surface location of the well. 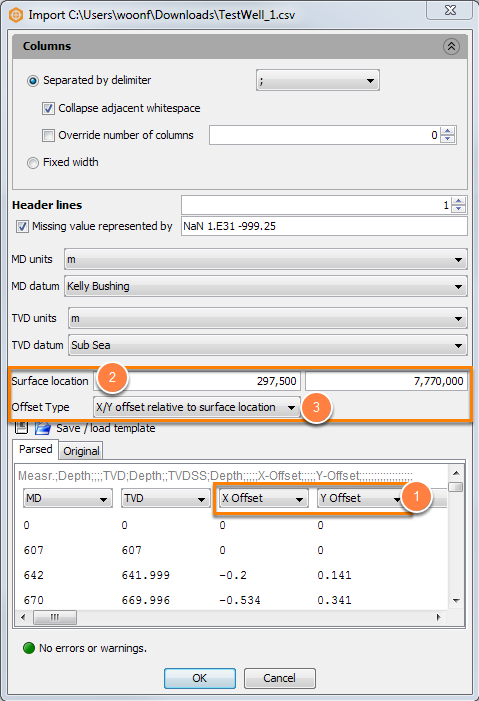 Select the Offset Type as X/Y offset relative to previous sample or X/Y offset relative to surface location. Insight also handles inclination and azimuth as deviated wells input. In the location columns, select Inclination and Azimuth. Note: When TVD, Inclination and Azimuth are provided, the TVD column data will be ignored. 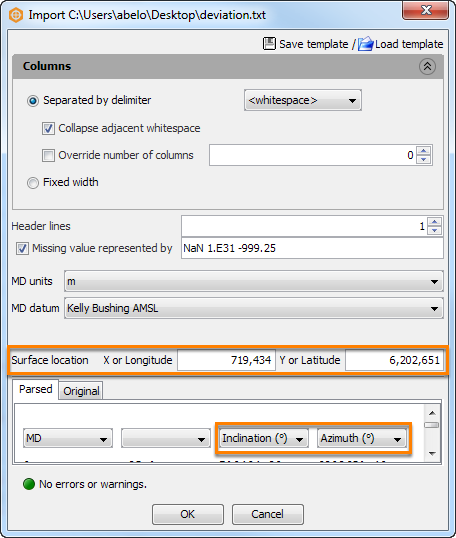 At Surface location, type the X/Y or Longitude/Latitude surface location of the well. Once you have added a deviation survey file and configured the import parameters, check if there is any more error or warning. Icon will turn green if there are no errors/warnings. To display well paths on Map View, select Show path on map in the Details Panel, and configure the colour, thickness, projection distance and display width in the Details Panel. For more information on well display, see Defining Default Well Settings.